Sense organs are special organs, specifically acquiring information from the environment and sending them on to the nervous centre in the form of electrical impulses. Snails do not have a brain in the strict sense of the word, but in most groups the neural knots (ganglia) are quite concentrated in a ring around the oesophagus near the head, also referred to as the buccal ring. The nervous system of snails. Acquiring and processing of sensual stimuli in snails only partially takes place using specialised sense organs. Especially smell, taste, humidity, temperature and touch are sensual information that is acquired by sense cells dispersed over the snail's outer skin. Those sense cells are especially concentrated on the head, the tentacles and the lips. Apart from their original task as tactile organs, a snail's tentacles and lips also carry sense cells of smell and taste. Sense organs according to the definition given in the beginning, in snails only are present in three different types: The eyes, the equilibrium organ and the so-called osphradium in gill-breathing snails. In the class of snails (Gastropoda) almost all thinkable stages of eye evolution are present. While ground-living limpets (Patellidae) are equipped sufficiently with pigment cup eyes, in herbivorous ormers (Haliotidae) and top shells (Trochidae) have developed into pinhole camera eyes. Closed vesicular eyes with a vesicle (bubble) of a refractive gelatinous secretion have developed in predatory marine gastropods, but also in freshwater gastropods. This gelatinous bubble has solidified to form a lens especially during the evolution of terrestrial snails, especially in the terrestrial pulmonate snails (Stylommatophora). Apart from their eyes as specialised sense organs, snails also have light sense cells in other parts of the body. Dispersed over the outer skin, those sense cells enable the snail to display a shadow reflex - a protective reaction to a shadow falling suddenly over the snail, which in nature usually means a predator. The equilibrium organs (statocysts) of snails are capsules or vesicles filled with liquid, calcareous grains (statoliths) floating within. As soon as the snail moves or changes its position, inertia has the statoliths float against the statocyst's wall. There, sense hair or cilia detect the contact which is then processed to the nervous system and the snail receives information about its position in space. 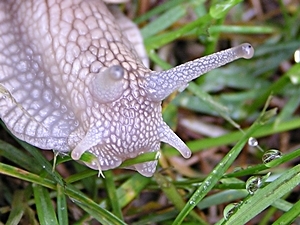 Snails' statocysts sit upon the pedal ganglia or the pleuro-pedal connective (the nerve between pleural and pedal ganglion), but they are innerved by the cerebral ganglion. Sipho of a common whelk (Buccinum undatum). Picture: Peter Jonas, Unterwasser-Welt Ostsee. The osphradium of gastropods is a specialised chemical sense organ, which originally is present twofold in the pallial cavity. So, while limpets (Patellidae) still possess two osphradia, the left osphradium is reduced in more advanced gastropod groups as a consequence of torsion. 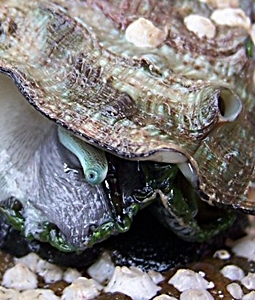 One of the osphradium's tasks is to examine water quality, so that the snail occasionally is able to close the mantle cavity at the right time. Mud snails (Viviparus) also use their osphradium to find partners. 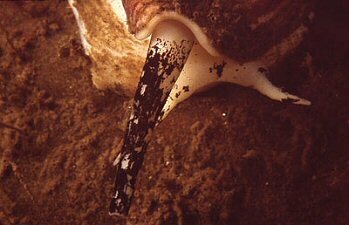 Carnivorous snails, such as the common whelk (Buccinum undatum), use their osphradium to find prey. To do so, they perform searching movements with their sipho to find its scent. On the other hand, even the usually quite stationary limpets flee, as soon as they detect a predator's (such as the netted dog whelk, Hinia reticulata) scent in their vicinity. Netted dog snails again only flee from sea stars they recognize as dangerous (not all sea stars are) by their scent. The osphradium, probably together with the gill, has been reduced during the evolution of terrestrial life in snails, apparently because the main part of the osphradium's task is achieved by examining the water flowing through the pallial cavity. Obviously, the air, pulmonate snails breathe cannot be examined that way. For that reason, terrestrial snails' tentacles, especially the small ones, have developed a special proficiency in detecting scents.